Apr. 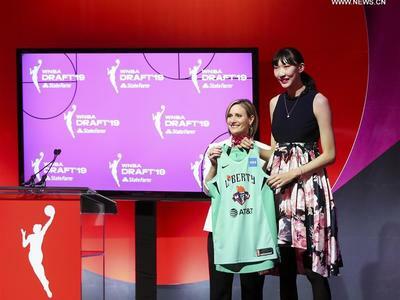 11 (NBD) -- Chinese basketball player Han Xu was selected by New York Liberty on Wednesday in the second round (14th overall) in the 2019 Women's National Basketball Association (WNBA) draft, an annual draft through which WNBA teams can select new players from a talent pool of college and professional women's basketball players, becoming the first Chinese draftee since the Los Angeles Sparks picked 6-foot-8 center Zheng Haixia in 1997. Before the event, news media The Associated Press and DraftSite projected she would be chosen in the first round by Connecticut Sun. Born in 1999 in Central China's Henan, the 6-foot-7 gifted center is the youngest Chinese player joining WNBA. Han's parents were also basketball players and her father ever served China Basketball Association. In 2016, Han stepped into the spotlight for the first time through the FIBA Under-17 World Championship. Scoring 18 points with 18 rebounds and 5 blocked shots, she helped the Chinese team defeat Spain in the quarterfinal round game, eventually ranking among top performers of the competition. Last summer, she was picked by and soon gained a foothold in the Chinese women's national basketball team, making her contribution to the team's gold medal of the 2018 Asian Games. Han drew more attention later at the FIBA Women's Basketball World Cup for a team-high 20 points in the game against the United States, quickly impressing her opponents. After participating in her first season of the Women's Chinese Basketball Association (WCBA) as a member of Xinjiang team, Han took a trip to Los Angeles for a special training last month in preparation for this year's WNBA draft. With a relatively slim figure, Han was aware of her weakness in strength. "I've been trying to get stronger. I am also developing my skills through training and competitions," said Han. It is noted that Han is the fifth Chinese athlete to play in the WNBA, after Zheng Haixia, Sui Feifei, Miao Lijie, and Chen Nan. In 1997, Zheng was drafted by the Los Angeles Sparks. Despite suffering from injuries, she still averaged 9.3 points and 4.4 rebounds per game during the season with the highest field goal percentage of 0.618. In 2005, Sacramento Monarchs welcomed the second Chinese WNBA player Sui and Miao followed in Sui's footsteps and joined the team one month later. Chen started serving Chicago Sky in 2009 but was cut in the same season. As a new comer making a run at the league, Han held that predecessors set examples for her, and she felt less stressed when stepping on the same path. In previous interviews, she has confirmed she would play in the WNBA this year. In addition to Han, Guangdong's center Li Yueru who was awarded MVP of the WCBA finals in 2019 was selected by Atlanta Dream. However, according to news outlet The Paper, Li confirmed her refusal of WNBA invitation.